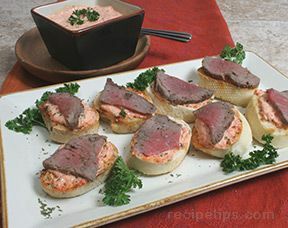 Divide beef into 24 equal servings. Slice tomatoes into 24 thin slices. Heat oven to 350°. Place bread slices on ungreased cookie sheet. Brush bread lightly with oil. Bake for 8-10 minutes or until crisp. Cool 5 minutes or until completely cooled. 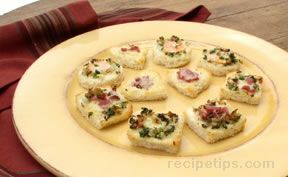 While bread is baking, combine mayonnaise, cheese, chives, capers and garlic powder. Mix well. Spread mayonnaise mixture onto cooled bread slices. 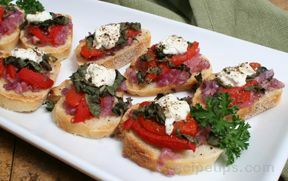 Top with roast beef, tomato slice and garnish with a spinkle of chives.